Ex-GUNS N’ ROSES drummer Steven Adler performed live for the first time with members of the the newly formed ADLER’S APPETITE FEATURING CONSTANTINE MAROULIS band at the the fourth annual “Ride For Ronnie” motorcycle ride and concert, which took place on Sunday, May 6 in Encino, California. Joining Adler for the “Mr. Brownstone” performance were his ADLER’S APPETITE bandmates Constantine Maroulis (vocals), Carl Restivo (rhythm guitar) and Michael Thomas (lead guitar) along with special guest Tanya O’Callaghan on bass. Check out video footage below (courtesy of Jessica Chase of Metal Horns Social Media Marketing). Adler, Maroulis, Restivo and Thomas, plus bassist Sean McNabb, will celebrate the 30th anniversary of GNR‘s classic debut album by performing “Appetite For Destruction” in its entirety on an Australian tour later this month. Each stop on Adler‘s Australian tour will feature a question-and-answer session with Steven and his mother, Deanna Adler, steadfast supporter and author of “Sweet Child Of Mine: How I Lost My Son To Guns N’ Roses”. During the last quarter century, Deanna Adler kept her diaries, journals, and personal letters, as well as a dozen scrapbooks and hundreds of photographs, putting them aside for safekeeping. This is your opportunity to experience the rare personal and emotive journey about raising her son, and the efforts of keeping him alive and herself sane. 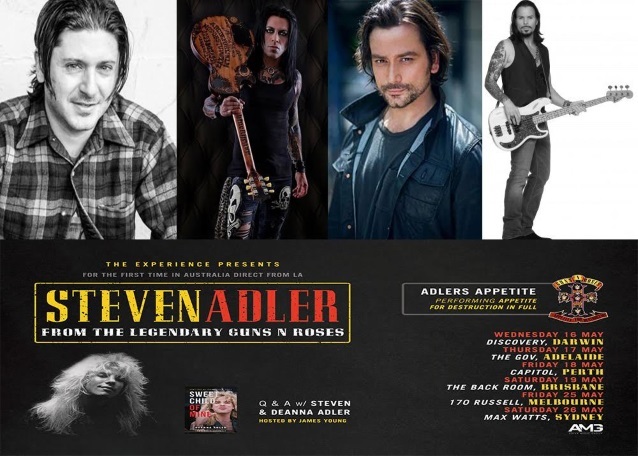 ADLER’S APPETITE FEATURING CONSTANTINE MAROULIS will make its official live debut on May 10 at the Whisky A Go Go in West Hollywood, California.